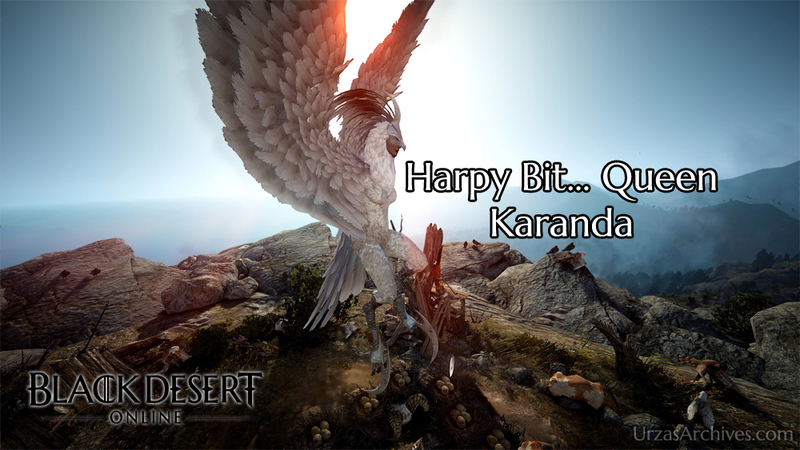 Harpy Queen Karanda is one of the most important Bosses in Black Desert Online as she will drop your best in Slot Awakening Weapon – the Dandelion Weapon. 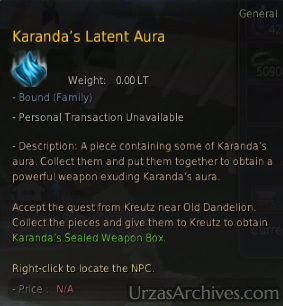 A lot of people do not like Karanda as her encounter seems kinda random on the first look but once you have figured out her attacks she is not worse than any other Field or World Boss in BDO. With this short guide you should be able to avoid most deaths while fighting her increasing the chance to get that delicious piece of equipment you are hoping for. Remember you can get the Dandelion Weapon through a quest if you gather 100 of her auras. Karanda herself is using five skills to prevent you from taking her treasures, two of those attacks are direct attacks that can be countered using blocks and iframes, another two attacks are deadly AoEs which will kill most people that get stuck inside them and last but not least she can summon a horde of harpies to attack you. We will go through easy skill one! Shriek is her basic attack. The damage itself is moderate and if you have aggro for too long without the using iframes or blocks it will certain kill you. The range of her Shriek is very high and you need to run far downhill to break attack. Please not that the attack is projectile based damaging you once the projectile impacts, this means you can still die even if you outranged her if she used her Shriek before you actually left her range. Her basic melee attack. There is not that much to talk about here. It deals moderate damage and if you have aggro outranging her melee range she will switch to Shriek until you left her Shriek range or you lost the aggro. It is very important to remember the animation of her summoning in order to maximize your DPS as you can easily mistake her Harpy Horde for one of her Ascending Skills. Basically she will fly in some kind of circle in the air calling for her Harpies and then landing with them to restart her basic attacks. The adds are fairly weak on their own but she is summing tons of them. A combined and focused attack can easily kill you but normally the Harpies instantly split on all the surrounding players and will short die after through basic AoE attacks. She will start using her AoE abilities between ~90%-~80% repeating them every ~15%-~20%. If there is not enough damaged dealt quickly she will repeat to use her AoE until she left the according HP area. The two AoE have a fixed attack pattern and based on the animation you will know what pattern she will use next. That will help you to move accordingly to reach a save position. Once you have found that save position simply moving their once her animation starts will prevent you from dying. Both AoEs are really powerful and you will most likely die through them. This attack is initiated by her dropping on the ground following a jump and a fast ascending into the air. 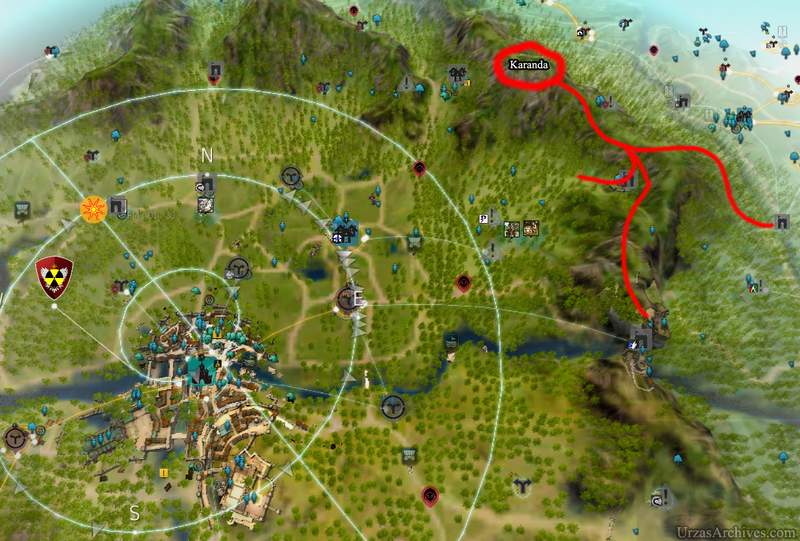 Move out of the red area if you want to survive this attack. This attack is initiated once Karanda slowly starts ascending into the air without any ground contact before. Move out of the yellow area if you like to stay alive. Please not that the maximum range of this attack is fairly huge. It is recommended you close in to her instead of trying to outrange her slow Ascend. 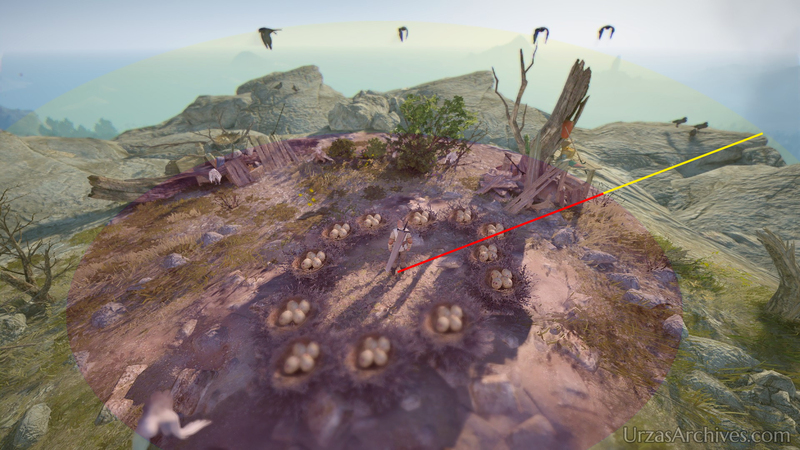 The best position for range classes is on the area where the red and the yellow circle touch each other from that position you can easily avoid any hit of her AoE attacks. In order to deal with her basic attacks the only thing you can do is to throw potion after potion or controlling your aggromanagement (as far as this is possible in BDO). However it seems like (could not fully confirm this until now) it seems she prefers her Shriek by far due to that melees are often completely ignored. You could try to close in to her melee range if you are a ranged class to prevent her from Shrieking you.